You wouldn’t find me sleeping in on Sunday growing up. And I’d rarely get to see that opening kick-off at the game. Instead, I’d be waiting for Dad to shake the final hand at church, pull off his necktie, and says, “Okay. Let’s go,” long after the sound system had been silenced and the parking lot cleared. As a teenager, I felt as though I practically lived at church, and only recently have I realized how much that was taken for granted. In 1944, as the Communists took over China, all religious activities were banned. Churches were closed or burned; pastors, priests and nuns were sent to the fields to become farmers. The Chinese Christians destroyed their bibles in fear of being labeled “counterrevolutionaries”. Only under the cover of darkness in the secrecy of mountain caves did they continue to meet and pray together. After years of reading the Bible, God’s words had been etched “stroke-by-stoke” on their souls. 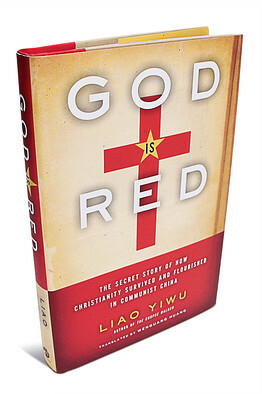 This week, I took a journey with Liao Yiwu, a man who embraced exile over silence in order to publish God Is Red, the secret story of the survival and spread of Christianity in Communist China. More than once, my eyes were flooded with tears as I read the stories of such ordinary people that refused to deny their life-changing faith. Each recounted the tale of those trailblazers who first came to China with the gospel of Jesus Christ; foreigners with blonde hair and blue eyes. The missionaries were known for their generosity, building hospitals, orphanages and schools. But soon, the foreigners were kicked out of China, leaving Christianity as only as a small spark in the land. However, that small spark became a blazing fire, which could not be denied, sweeping across China despite harsh persecution. The spark came as a preacher who would not stop sharing his faith, even inside the prison walls. The spark came as a doctor who gave up the “good life” to bring medical treatment, compassion and Christ to forgotten villagers. The spark came as a reverend, now memorialized in Westminster Abbey, whose tongue was slashed out to keep him from preaching during his trial. These people, and countless others, were marked as spies and counterrevolutionaries, accused of “poisoning people’s minds with spiritual opium”. Liao shares their tales, unscripted and uncensored, as they battled for freedom of expression and religion. And, all the while, my heart seemed the bleed within my chest, challenged by their continued existence. 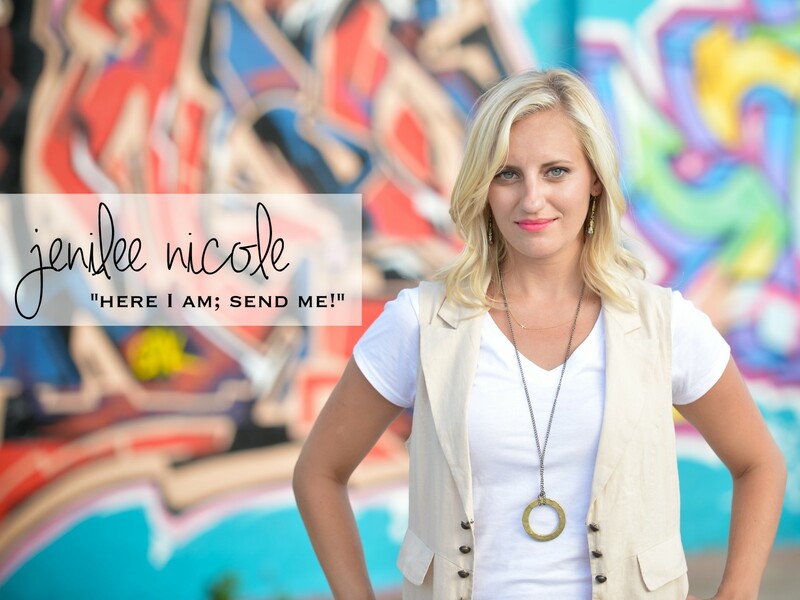 What if my faith were put to the test; would I persevere? Am I known, not just for being a Christian, but for my generosity for others? What will my legacy be? And, though not converted himself, Liao, too marvels at these Christians, “moved by the sustaining power of faith and the optimistic spirit among the congregations he encountered.” Christianity has now flourished in China. According to new surveys, there are now about 100 million Chinese Christians worshipping independently of the government sanctioned state churches. Those who call themselves Christ-followers now outnumber the Communist party. This is one of those books, that stayed in my heart for days. A book, or really a challenge, which cannot be shaken. It’s my favorite question to ask the bride when we meet for the first time. And then, her eyes light up and a smile creeps across her face as she describes in explicit detail the gown she will wear. Somewhere in the fog of detail, her and I forget we’re meeting in the studio to supposedly discuss photography packages. Instead, we’re both caught up in a steady stream of lace, ruffles, pearls and satin. Months later, I’ll find myself stowed away in her dressing room with a camera in hand, capturing giggles from bridesmaids and picture-perfect curls being formed. And then my favorite long-awaited moment comes. She slips one leg into the mess of fabric. The gown is pulled up and laced tightly, she’s adorned in simple jewels and she turns to take in her reflection for the very first time. And for one brief moment, the room goes still. I forget about my camera, and we all sigh in unison. The vision before us can only be described as breathtaking. It doesn’t matter how many weddings we shoot, or how many brides I meet – the moment she first appears in all her anticipated glory is nothing short of epic. And the moment always reminds me of that upcoming wedding hosted by God himself in which all of humanity has been invited. A wedding which will make the Royal Wedding look like child’s play. Christ is the groom and we, the body of believers, are His bride. The cotton candy colored sky and the white-topped mountains are only a foreshadowing of God’s glory and creativity, which will reach its peak with the wedding feast ushering in a new heaven and new earth. The wedding attendees will be clothed in special garments. Like any typical girl, I’ve already begun thinking about what I will arrive wearing. 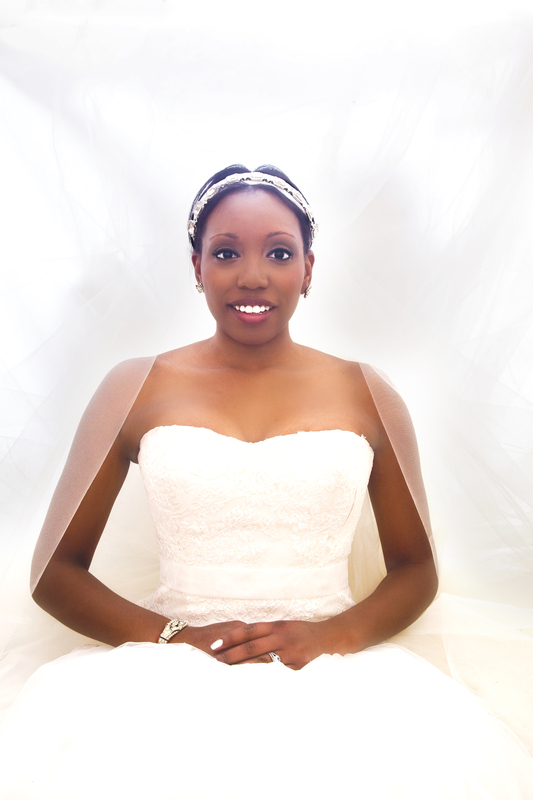 My dress won’t be self-made or even purchased from a famed boutique, because it could never, ever be good enough. The way I live my life on earth will determine the beauty of my future dress, and as Isaiah writes, “all our righteous acts are like filthy rags.” Isaiah’s defines filthy rags as menstrual garments– how ridiculous to think about showing off a used tampon! In the same way, it’s ludicrous to assume that any of my “good deeds” could impress a holy God. For my sins far outweigh any good I have done. I won’t be able to enter heaven without my special wedding garment, this robe of righteousness. Only God can give me the glorious robe; it’s a free gift. And I’ve already accepted it. Have you? Today is Valentine’s Day; a day that will no doubt begin with a groan from those whose Facebook status still reads single. 11,000 children will be conceived today! Valentine’s Day is a reason to celebrate. Because, five months into my new marriage, I’m still in love with Jeff Mullikin. 14. Because when I am sick, he insists on coming with me to the doctor. 13. Because he somehow always knows where to find my phone when it’s lost. 11. Because he still tells me I’m beautiful. 10. Because he SPOILS our dog. 9. Because he actually rode a roller coaster for me at Silver Dollar City this winter. 8. Because he always talks to me with kindness. He never raises his voice at me. 7. BECAUSE HE’S SO HANDSOME! 6. Because I love working with him. 5. Because he won’t watch a Chief’s game without his jersey on – even if he’s all alone. 3. Because he shoveled the snow off the sidewalk last night before my friends came over without even telling me. 1. Because he now introduces me as “his wife”!!! Happy Valentine’s Day Jeff! I love you! 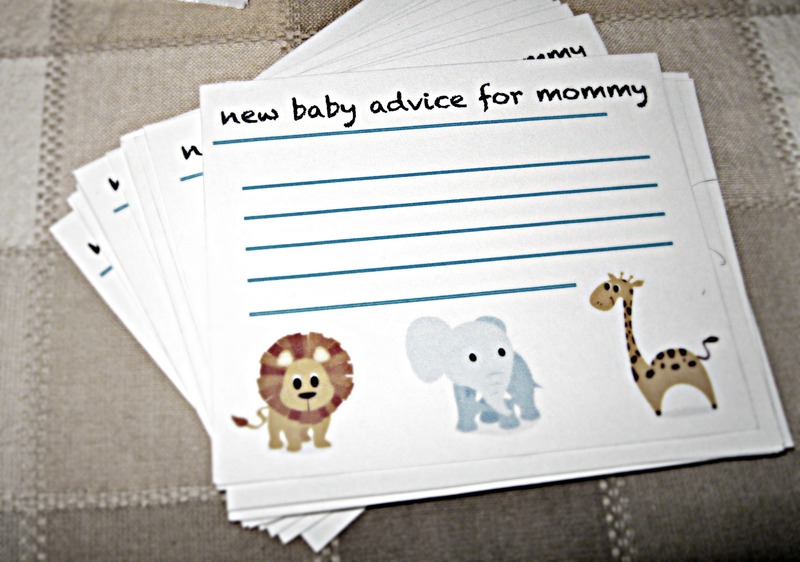 I decided on a Noah’s Ark theme for the baby shower. I had trouble locating a great book on the classic biblical story, but finally found a pop-up book at Barnes & Noble. 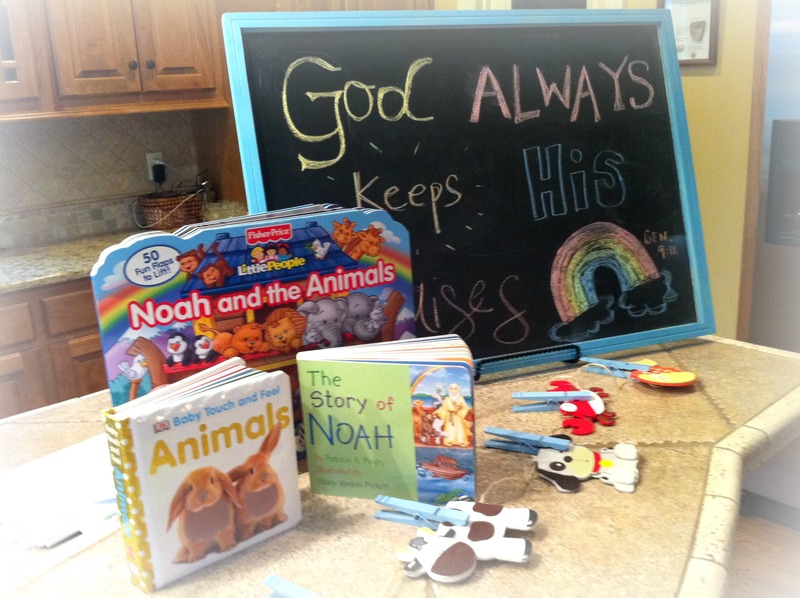 I found the wooden Noah’s Ark at Hobby Lobby and painted it with acrylic paint. 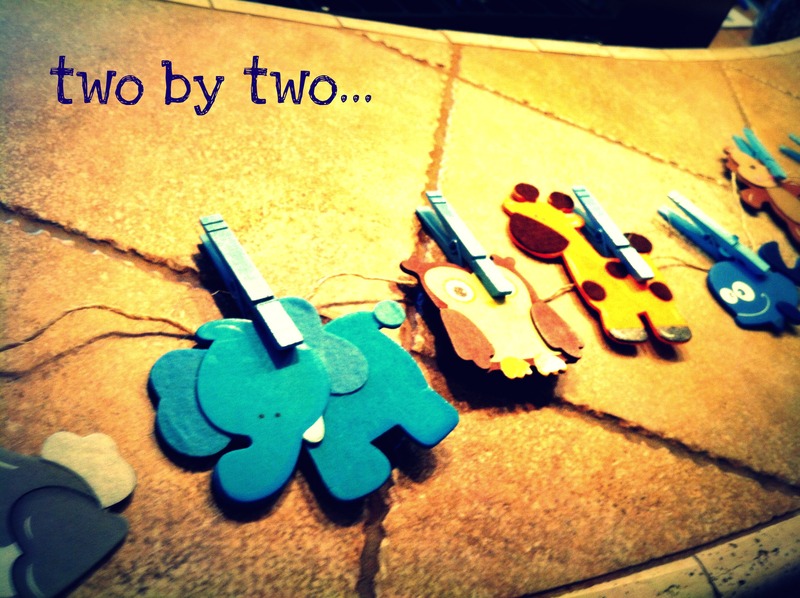 I spray painted the clothes pins and thankfully, the animals were already pre-painted. I hung the animals on twine with the pins and spread them across the bar headed into the ark! 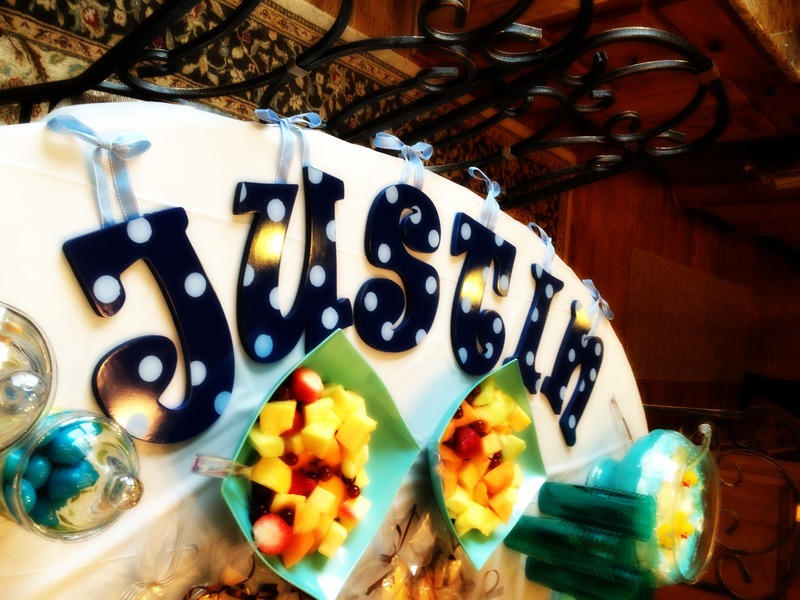 The blue, bubble bath punch was a huge hit! 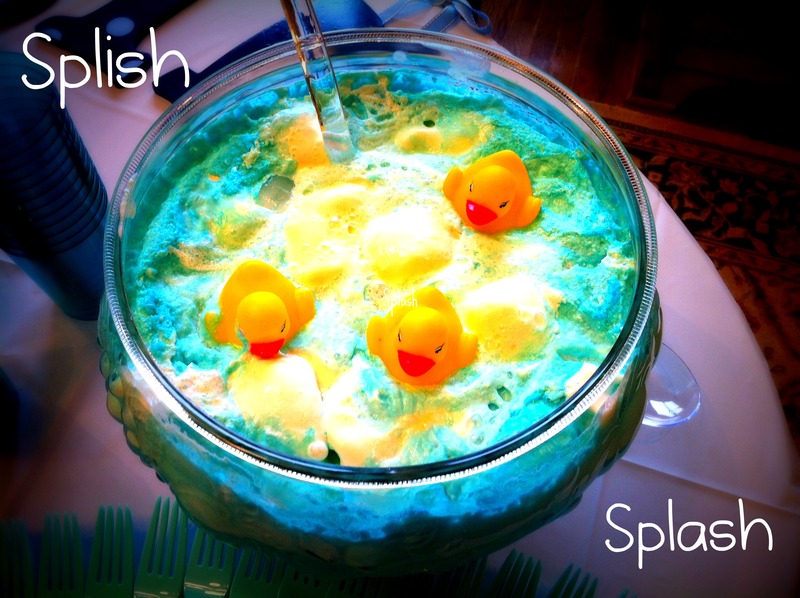 I got the recipe here and added a few rubber duckies to make it appear like a baby’s bath. Not only was it cute, but also very tasty! Audrey has Lily’s name spelled out in letters on her pink wall, so I thought I would go ahead and make those same letters for Justin’s room. 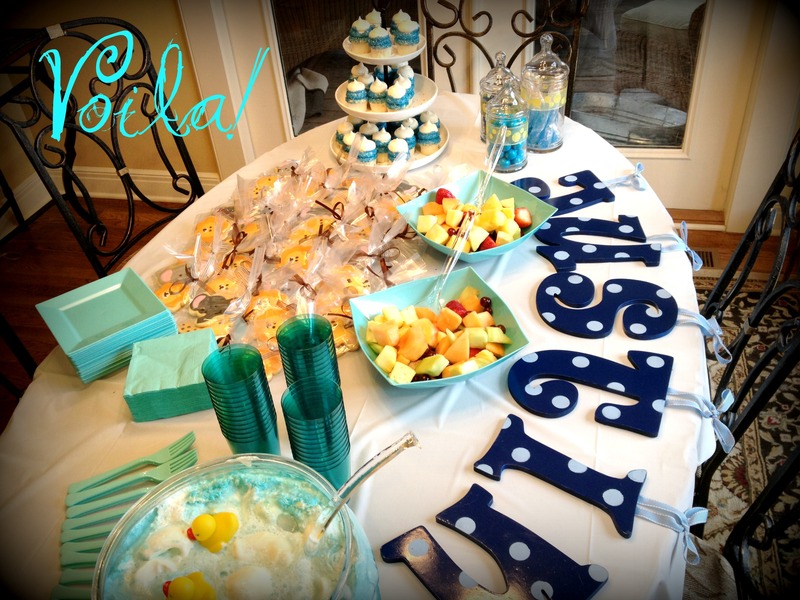 I purchased the wooden letters from Hobby Lobby, spray painted them navy blue, stenciled on the baby blue polka dots and added the ribbed with a hot glue gun. It’s not a party without Gigi’s cupcakes! 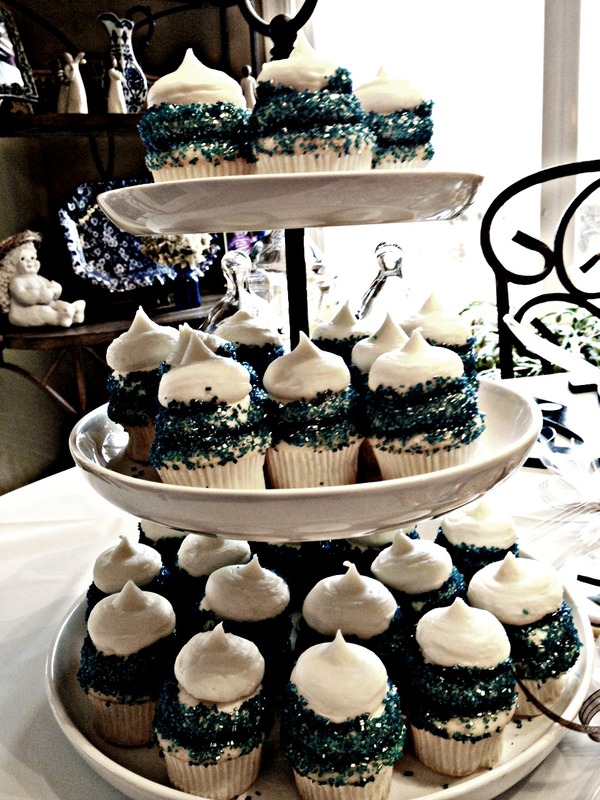 These were there mini cupcakes in the wedding cake flavor, but they added blue sprinkles for the baby boy shower theme. 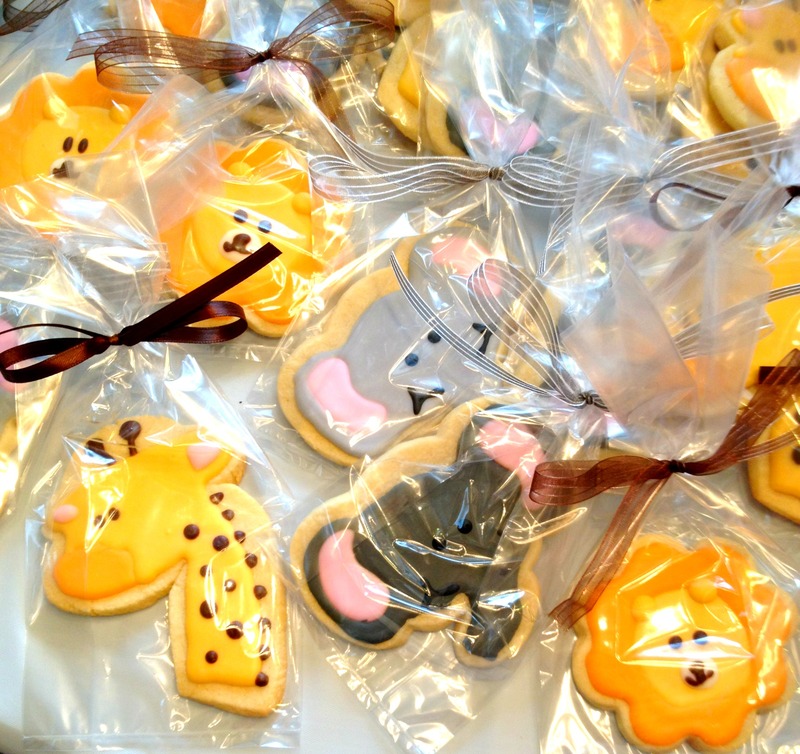 To go along with the Noah’s Ark theme, my friend, Shelley, made these beautiful animal sugar cookies! 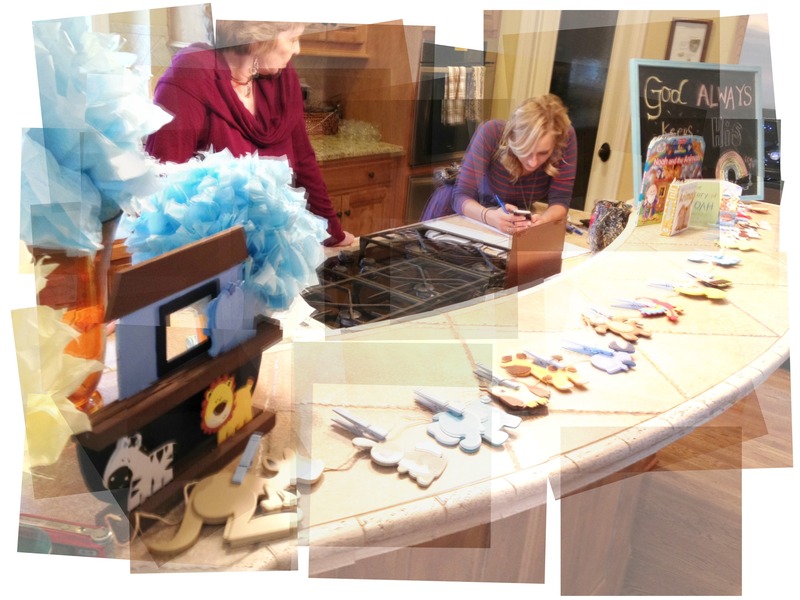 Shelley does incredible work (including my wedding cake in Florida) and I saw most of the women leaving with an extra cookie to take home to their men! My husband, Jeff, designed these cards for me! The responses were very humorous, but the majority of mom’s reminded Audrey that the house can wait and to have fun with the new baby because they grow SO fast! Audrey is due to give birth to a baby boy, Justin Jay, in March and we are all very excited!